JENar™ F-theta objective lenses can be used for the high-precision micro structuring, marking and labeling of a wide range of materials. JENar™ F-theta objective lenses are particularly well suited for use in micromachining laser applications. You can use standard F-theta lenses at laser wavelengths of UV to VIS and IR: You will receive objective lenses for wavelengths of 1080 to 355 nanometers. 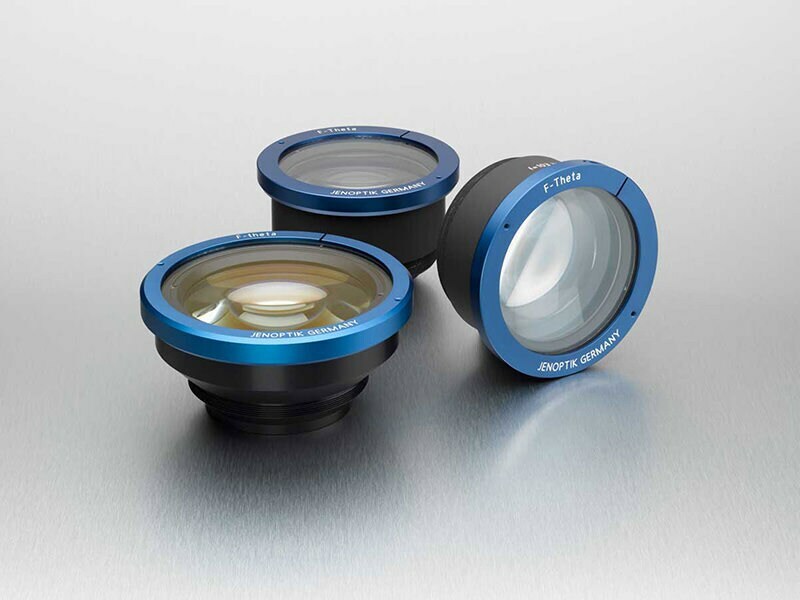 The conventional F-theta objective lenses from Jenoptik offer exceptional durability and enable you to perform high-precision laser material processing. You can use them for the micro structuring, marking and labeling of a wide range of materials. The F-theta lenses come with protective glass. As a special service, we are able to offer you our STEP files, which allow you to integrate the JENar™ F-theta objective lenses quickly and easily into any system. Each objective lens undergoes a standardized application testing procedure. This enables us to achieve highly consistent optical properties throughout series production. You will benefit as the F-Theta lenses are easy to change and the life-cycle stability is increased. In addition to these standard designs, we can develop complete systems for you, using components from laser beam shaping to the expansion and splitting of laser beams. 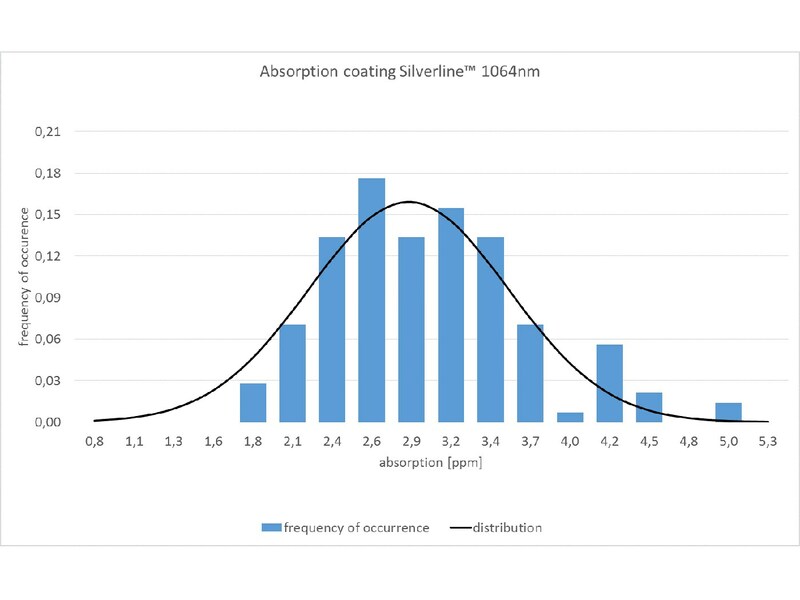 For high-power applications using fiber lasers and short-pulse lasers, our experts have developed full-fused silica lenses: the Silverline™ F-theta product family. 1) New product variants with improved VIS performance for visual monitoring of the manufacturing process at 1030 nm … 1080 nm. In the band from 500 nm … 680 nm transmission of these lenses is better than 85%, which allows direct monitoring of the process using a straightforward image sensor/filter combination. The values given are nominal values for the specified application parameters. Jenoptik provides Zemax®BlackBox files for simulating application results for customized parameters (e.g. wavelength, scanner geometry, beam diameter, ...). For our full-fused silica objective lenses, please click here. which gives those special lenses their name f theta. Whereas the merits of good optical performance are easy to see, the advantages of the f theta relation are more subtle and best understood considering polygon scanners. Those scanners rotate with a constant angular velocity. If the image height would be proportional to the tangens of Θ, then the speed of the spot on the workpiece would increase for higher angles and therefore, the energy deposited in the material would decrease, possibly resulting in inhomogeneous application performance. Since the f theta lens translates the constant angular velocity of the polygon to a constant velocity of the spot on the workpiece, thisproblem disappears. In theoretical nomenclature, the focal length is the distance from the second cardinal plane to the paraxial focus point of the objective. That means, if one would represent the objective as having vanishing length, then the distance from this ideal lens to the focus would be the focal length. From the f theta relation h = f * theta, the image height is proportional to the focal length, i.e. if one wants to increase the area of application then one can use lenses with bigger focal length. However, if one wants to retain the same spot size, then, according to the focus size definition, one would also have to increase the laser input beam size. Another property is the distance between lens and workpiece. If this has to be increased, usually an increase in focal length is required. When using a galvo 2D-scanner, changing the mirror angles moves the laser spot over the workpiece. The Jenoptik's f theta lenses are then optimized for a quadratic scan field where the diagonal of this square is denoted as the scan field diagonal. If the galvo mirrors are tilted more than the angles corresponding to the quadratic scan field area two major effects appear. Firstly, the optical performance will degrade above diffraction limit, and secondly the laser beam might be clipped inside the objective. The geometry of a 2D galvo scanner is very important for the design of an efficient lens. Since the two galvo scan mirrors have to have a certain distance to prevent collision, the application performance will not be rotationally symmetric, instead they will exhibit a two fold mirror-symmetry in X and Y. The distance between the mirrors is given by the parameter a1. The distance from the second mirror to the flange of the objective is described by parameter a2. The separation of mirrors makes the physical concept of a pupil in admissable. One therefore defines an effective pupil as being positioned in the middle between the two mirrors. The non-existence of a real pupil also has the consequence that a 2D-galvanometric scan system cannot be perfectly telecentric. Different optical properties of an existing f theta lens can be modified by modifying the scanner geometry. But care must be taken not to create clipping of the laser beam somewhere in the objective. For example, increasing the distance between objective and effective pupil changes the telecentricity angle (usually it decreases it). But to prevent clipping the maximum scan angle, and therefore the maximum field size, must be reduced as well. 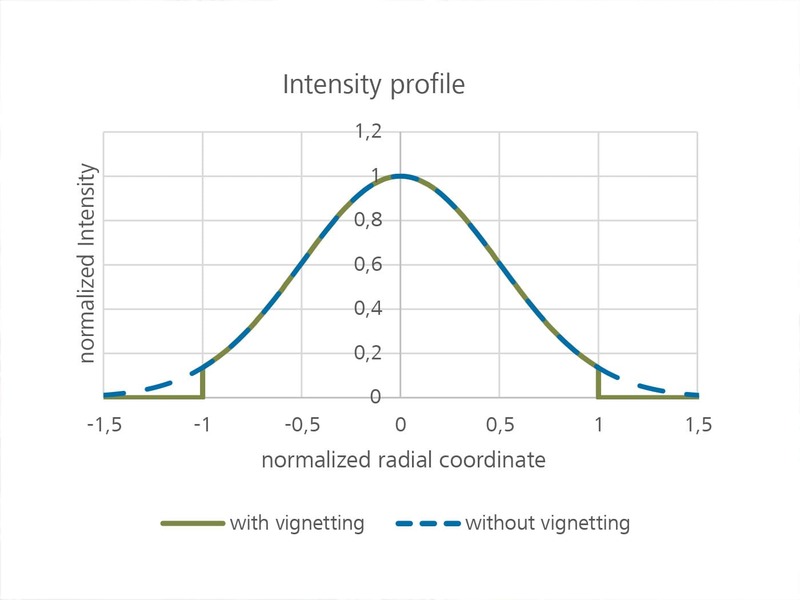 Telecentricity describes the angle of the centroid of the laser beam at the edge of the scan field, for example how much the entire beam is tilted with respect to the optical axis. 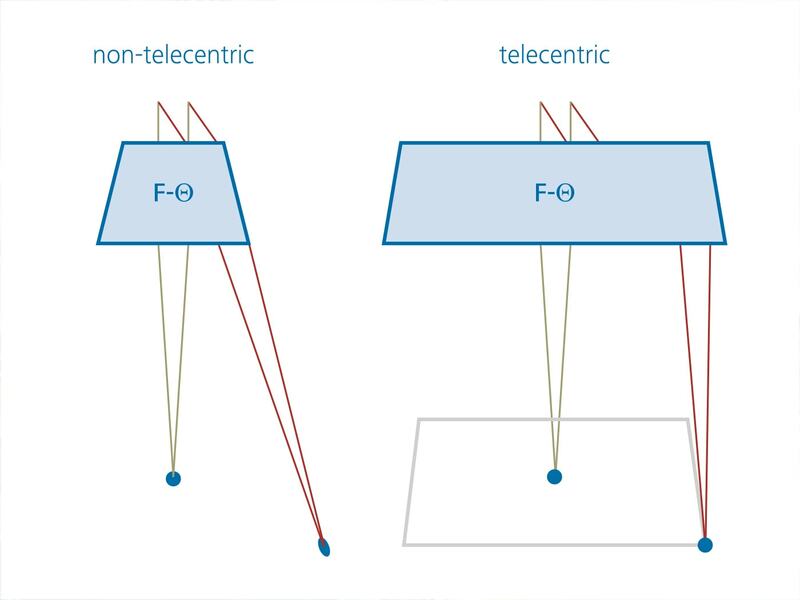 Telecentric lenses usually show a more homogeneous focus size distribution over the full field. Furthermore, telecentric lenses are more „scale preserving“ when the workpiece is defocussed. For example, if the workpiece is moved away from the lens, but the tilt of the laser beamis vanishing, the spot position will not change. This is important in drilling applications. An immediate consequence of a small telecentricity angle is that the lenses have approximately the same diameter as the field diagonal. Therefore, telecentric lenses are usually more expensive than non-telecentric ones. 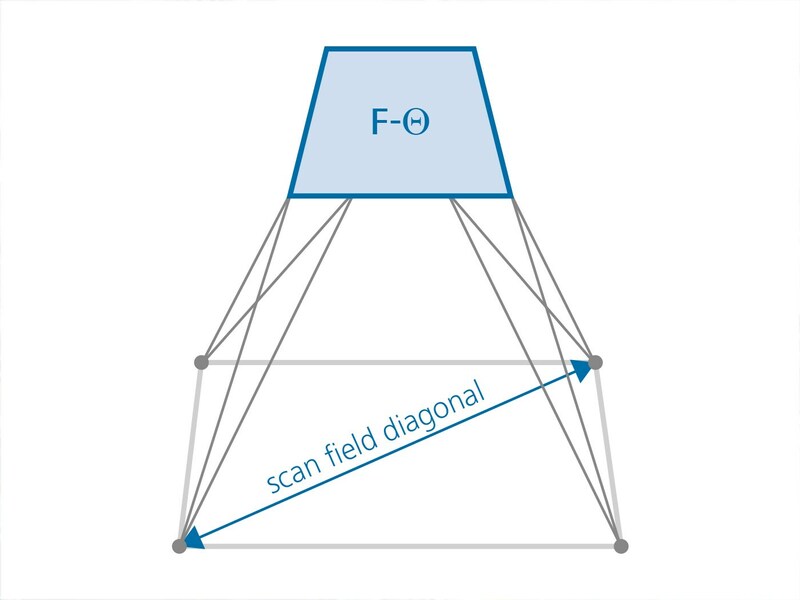 The max full diagonal scan angle corresponds to the scanfield diagonal, i.e. using the objective with angles above this maximum angle will lead to clipping of the beam. From the f theta relation one sees that an increase of the field size can also be achieved by using bigger scan angles. This would have the advantage that the beam size would stay the same. However, big scan angles pose a considerable complication for the design of cost effective f theta lenses. To control stray light, and also reduce the required size of optical elements in laser material processing applications, the incoming Gaussian laser beam will usually be clipped at the diameter where the intensity has fallen to 1/e² of the maximum value. The objectives are designed such that those beams will pass through the objective without being clipped anywhere. The input beam diameter immediately affects the spot size via the spot size relation anti proportionally. Bigger beam diameters result in smaller spot sizes and vice versa. Using beams with diameters above the maximum allowed beam size will lead to clipping of the beam at the edges of the field. Decreasing the focus size immediately decreases the structure sizes of the patterns written. It also increases the maximum intensity in the center of the spot, therefore lifting it above the application threshold of a particular material. If, however, the intensity is way above the application threshold, the energy not needed for the application processed is deposited in the material leading to varying non-controllable side effects, possibly reducing the application performance. Therefore, the user has to find the optimal focus size for the application under question. When light passes through an optical material of non-vanishing dispersion it accumulates a wavelength dependent optical phase. For laser pulses, which are effectively a linear superposition of harmonic oscillations of different wavelengths, this influences the pulse shape.In a second order approximation for gaussian pulses, the temporal stretching of the laser pulse is determined only by the second derivative of the phase change with respect to the light frequency, also called the group delay dispersion (GDD / P2). The shape of the laser pulse stays gaussian, but its width, expressed as its standard deviation, is scaled as: P3 . A temporal stretching of the laser pulse reduces its maximal intensity. This might have severe impact on the application performance. To remedy the problem of too long pulses at the workpiece due to pulse stretching one could use lasers with even shorter output pulses. This might increase the intensity above the damage threshold of the involved optical system. 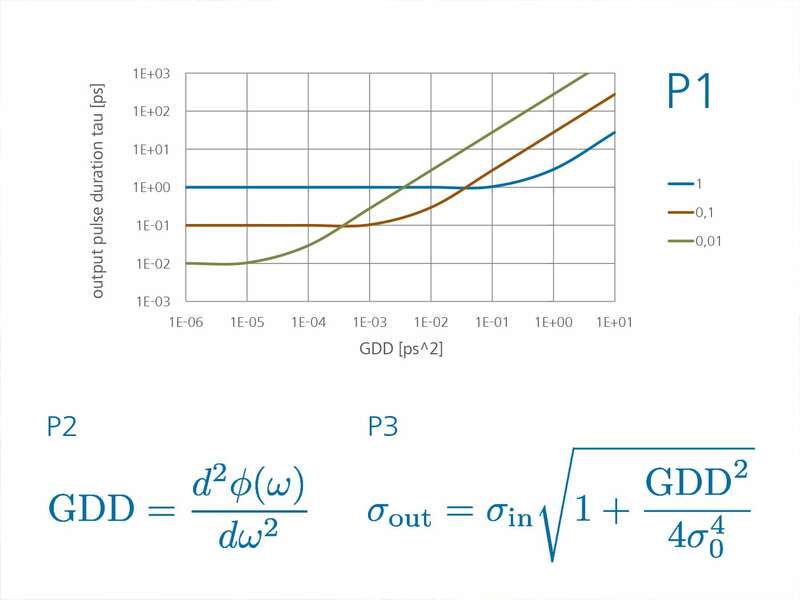 Another way would be a precompensation of the induced GDD by gratings, prisms, and microoptial elements (P1).